The growth of Online Travel Agencies (OTAs) over the last decade has posed both real opportunities and major risks for the hospitality industry. These positives and challenges are particularly pronounced for independent properties around the world – both larger hotels/resorts and smaller, owner operators. Such properties, regardless of size, often lack the digital marketing skills and knowledge to effectively build a strong online presence of their own. This gap has been seized by OTAs – sophisticated digital intermediaries that market these businesses online and command a commission (and other benefits) for doing so. However, building a balanced approach to online distribution – especially with the right mix of direct vs. OTA bookings – is critical to driving success in the hospitality industry. The global OTA landscape is currently dominated by Expedia (which also owns Travelocity, Orbitz, Wotif and HomeAway) and Booking.com (part of the Priceline Group). In many markets they operate as an effective duopoly. They charge between 15-30% in commissions and can commonly control more than 50% of a hotel’s online bookings. These two dominant OTAs are now seeing increased competition from TripAdvisor and Google, who are now more assertively driving online booking revenue (to complement their advertising business). One important difference: though their commissions are still significant (e.g., 15%), they offer “direct bookings,” passing the booking and therefore control of the guest’s information to the property’s own reservation system. It must be acknowledged upfront that all these OTAs are an important marketing partner and a valuable source of bookings – especially for harder to reach travelers such as international visitors (especially in foreign language or emerging markets). OTAs have been true innovators: pioneers in highly sophisticated and personalized digital marketing, in building major global brands and in popularizing online travel bookings around the world. They have built a dominant position in many markets, with travelers in a number of countries demonstrating a preference to book via an OTA rather than with the hotel directly. 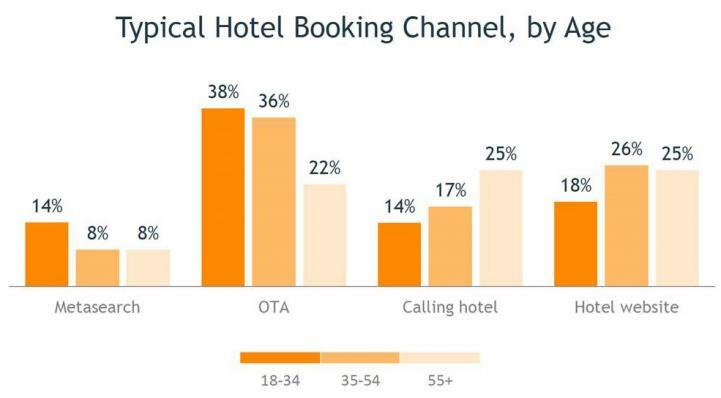 The latest research shows this strength in OTA bookings in the U.S. (and many other markets) is particularly pronounced in younger, more brand agnostic travelers. OTA commissions have settled close to a 20% average for the two dominant OTAs, Expedia and Booking.com, with the former lowering their commissions from 25% in some instances and Booking.com increasing their standard commission range to 15-18% with higher rates for properties willing to pay for better placement. A commission of around one-fifth of gross revenue on any significant level of business has major implications for yield. This is especially true in competitive or price-sensitive markets, in off seasons on discounted rates and for more “generic” hotels without a unique value proposition. The result of an over reliance on OTA bookings can have a major impact on profitability and therefore the ability to reinvest in the property and marketing. Arguably this factor is far more significant than the cost of OTA commissions but is often poorly understood by the industry. Visitors who book through OTAs may be a guest of the property but are customers of the OTA. No contact information is provided to the property to understand their needs, build a customer database or to remarket to them. OTAs control, re-market and, in fact, re-sell this customer information to marketing and Big Data partners for significant ancillary revenue. Information is power, and in managing the guest relationship and the opportunity to sell them other destinations, properties and travel products, OTAs have huge market strength. OTAs have fostered an environment of price-led marketing where brands, service and value is often subsidiary to deals or to properties willing to pay a higher commission to be featured first. OTAs can also undercut a property’s lowest published rate using some of their commissions; the latest in OTAs' assertive promotion of a “Best Price Guarantee.” In an OTA-dominated market, hotels are increasingly price takers not price setters. Like other multinationals such as Apple, Facebook and Google, OTAs have been extremely aggressive in minimizing their tax obligations in many states, cities and countries around the world. In many jurisdictions they have been slow to pay bed, sales, VAT or GST taxes on their commissions – impacting the revenue of CVBs and government entities committed to supporting tourism and communities. Most independent properties and hotels by comparison need to meet their full tax obligations – creating an uneven playing field on the cost of doing business. Miles sponsored the largest-ever study of independent hotels and what drives their marketing success (see source below). Some of its key insights are included in Part 2 of this blog. It is the full recognition of these issues that has prompted most major multinational hotel groups to assertively seek to rebuild their level of direct bookings (see Part 2 of this blog). In summary, OTAs are important marketing partners to the accommodation sector, creating valuable business especially in hard-to-reach markets or periods of soft demand. However, properties that become overly reliant on OTA bookings, especially from their core markets or regular guests, face significant risks and challenges. In Part 2 of this blog we cover the seven specific actions and skills that hotels need to foster a smart balance of OTA and direct online business.